They were courteous and very responsive. The home was great and we especially enjoyed the photographic art work in the house as well as the opportunity to observe the many species of birds from the deck. We will definitely be back. Kim and Cherry were helpful and available to answer our questions and responded immediately to a minor maintenance concern. The property was stunning and we enjoyed it so much that we are returning in 2020. I had a member of your team call me to make sure I had received directions and instructions. She was kind enough to let me know what kind of coffee pot was there so I could come prepared with the right coffee. Loved the southwest style of the home. Nicely decorated, in a quiet area with privacy. Only 20 minutes from Sedona and about 30 minutes from Jerome. Loved the fireplace in the family room, the outdoor fireplace, and the patio light fixtures which were beautiful in the evening. Gardeners should come a little later. They showed up at 7am. Internet is a little spotty but still works. Would definitely come back. I was able to interact via email with the team. Their responses were prompt and pleasant. The home was centrally located yet secluded. The personal touches by the owners including a folder introducing themselves and their home and the local area, as well as interesting books in the home, created a warm welcome. The setting in Canyon Mesa CC was very nice. 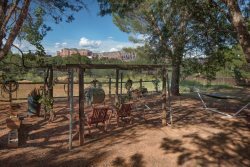 The Village of Oak Creek is a good place for access to restaurants and Sedona. Beautiful little cottage within walking distance to everything we wanted to do. Nicely decorated and very clean. Hated we only had 2 days there. Cherry was very helpful and professional, a joy to work with. We were delighted to work with the staff at Foothills. From our first contact and inquiry, through the rental agreement, check in, occupancy, and check out, things could not have been easier or more efficient. The home was pristine, comfortable, secure, well appointed and centrally located. We thoroughly enjoyed our 8 week stay, and hosted friends and family members who visited the area. We would definitely recommend this property, and would stay there again on our next visit if it is available. What an amazing home! The furnishings are all modern and the remodel they did was very nice! Great views from the deck - was nice to entertain guests from out of town! The master bedroom is huge and all the guest rooms are furnished with excellent taste. Lots of natural light and the architecture makes this home so unique! 3 bedrooms have patios which was a nice bonus! The mini split HVAC's allowed each guest room to set their own temperature! Just outside the Village of Oak Creek, you are close enough to everything yet off the beaten path to enjoy nature and feel secluded! Spacious yard with plenty of parking and you can see the stars at night quite well from this area! Highly recommended! We have stayed here before and will again. The phone on property wasn't working but that was readily resolved by your team. We have always found your team to be responsive and friendly. I like the change to a lock box on the property rather than needing to go to the office Some of the email instructions were out of date with the changes but that seems to have been corrected. The location of this property is ideal for us; out of the Sedona traffic but close enough to get there when we choose. We do use the community clubhouse while here and participate in the activities even though most folks are homeowners and we are just vacation renters. The view is fantastic, it makes this place. This was our 16th year here. Is that a recommendation? We've worked with Foothills for 13 years. The staff have been easy to work with and they have always responded quickly to any questions or concerns we had. We have enjoyed this location very much.